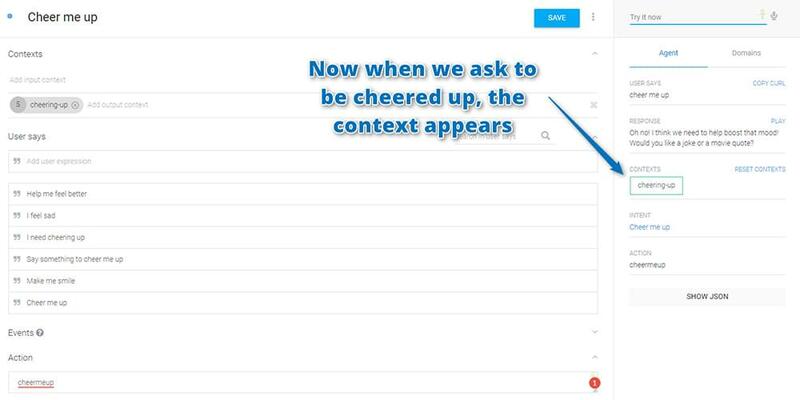 If you’re keen to learn more on AI, check out our screencast Microsoft Cognitive Services and the Text Analytics API, for AI sentiment in your bot. Api.ai is a really simple service that allows developers to create their own basic personal AI assistant/chatbot that works a bit like Siri and Amazon’s Alexa. I recently covered how to build your own AI assistant using Api.ai, where I showed the basics of setting up an AI assistant and teaching it some basic small talk. 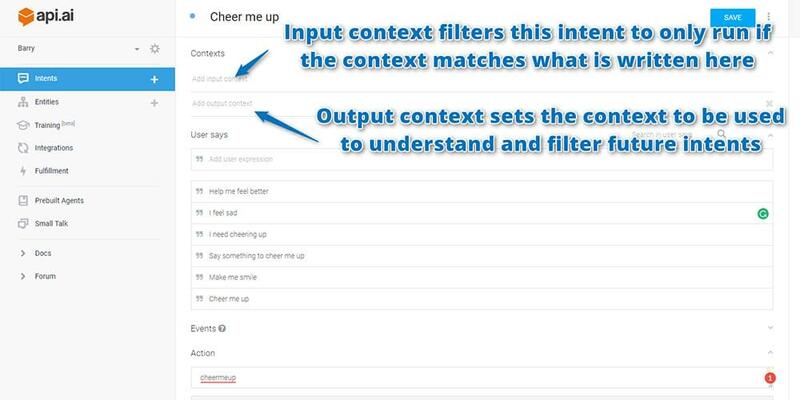 In this article, I’d like to go a step further and introduce “intents” and “contexts”, a way of teaching our AI assistants more specific actions that are personalized to our own needs. This is where things can get really exciting. Note: this article was updated in 2017 to reflect recent changes to Api.ai. An intent is a concept that your assistant can be taught to understand and react to with a specific action. 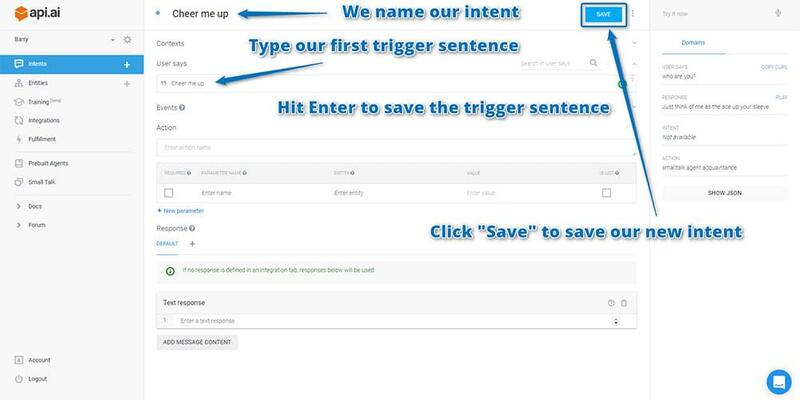 An intent contains a range of contexts that we can enter as sentences that the user might say to our assistant. A few examples could include “Order me lunch”, “Show me today’s daily Garfield comic strip”, “Send a random GIF to the SitePoint team on Slack”, “Cheer me up” and so on. Each of those would be custom intents which we could train our assistant to understand. Now there’s a range of sentences the assistant should understand, but you haven’t told it what action is expected when it hears them. To do so, create an “action”. The assistant will return “action” names back to your web app to allow it to respond. 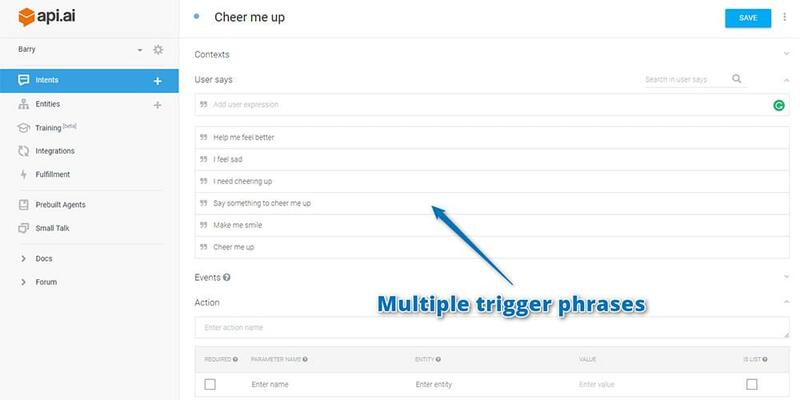 In this case, you won’t respond to the first action that’s been called “cheermeup”, but it will come in handy in future when responding to actions in your web app. I’d recommend always including action names for your intents. 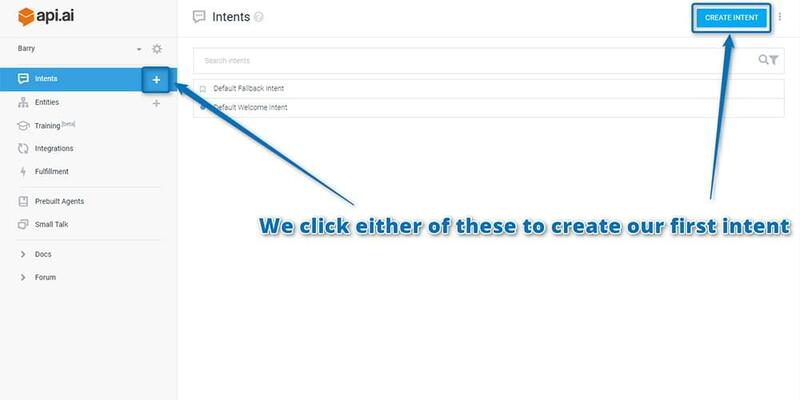 You can add in parameters into your actions too, but I’ll cover that in detail within our next article on Api.ai! Finally, click the “Save” button next to your intent name to save your progress. These variations seemed to only trigger after I’d used the original phrase with the bot first. I’m not sure if it’s just a delay in how long it takes to generate understanding of similar phrases, but if a variation doesn’t work, try asking it the original statement first. If your variation is too different, you’ll need to add it into the context’s statements. The more statements you add here, the better our agent will be able to respond. One thing you might notice if you used a statement like “I’m sorry to hear that! 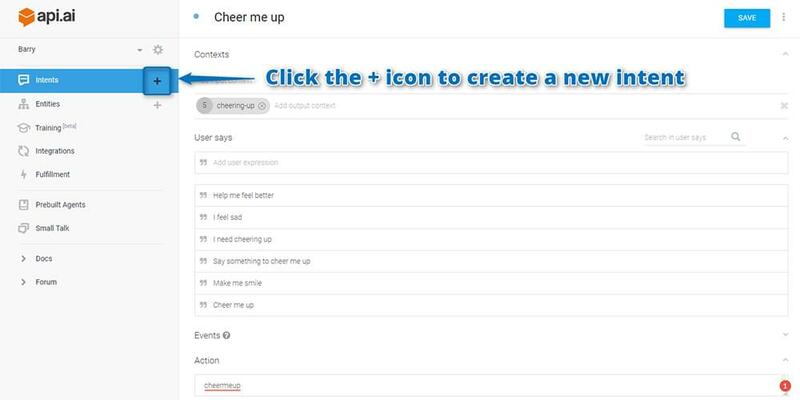 How can I help you feel better?” is that it isn’t quite specific enough to guide the user. If they aren’t aware of the options of either “movie quote” or “joke”, then they might ask for something you haven’t covered! Over time, you can train up your agent to understand many other concepts. However, for now I’d recommend being specific with your questions! By guiding the conversation with your speech response, your agent needs a way to follow what the conversation was about when the user next speaks to them. 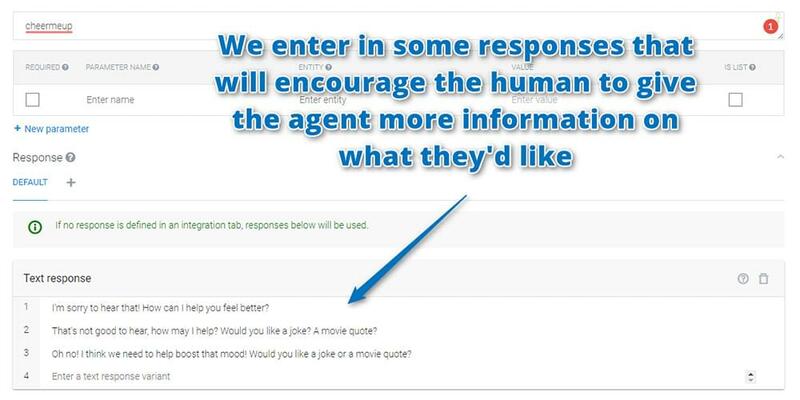 If a user says the words “A joke” or even “Either one” without any prior conversation, out of context that sentence might not be too clear for the agent to respond to. How would you respond if I talked up to you and just said “A joke”? That’d be what your assistant would be given at the moment, as it has no way of remembering where the conversation was leading previously. This is where setting contexts in Api.ai comes in. 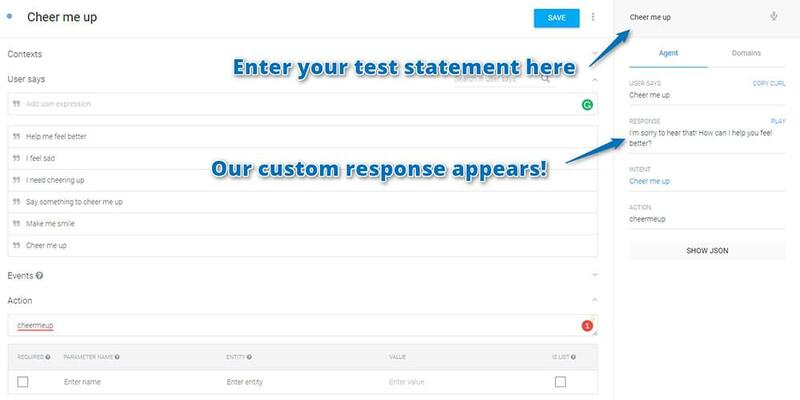 We create contexts to track what the user and agent have been speaking about. Without contexts, each sentence would be completely isolated from the one before it. 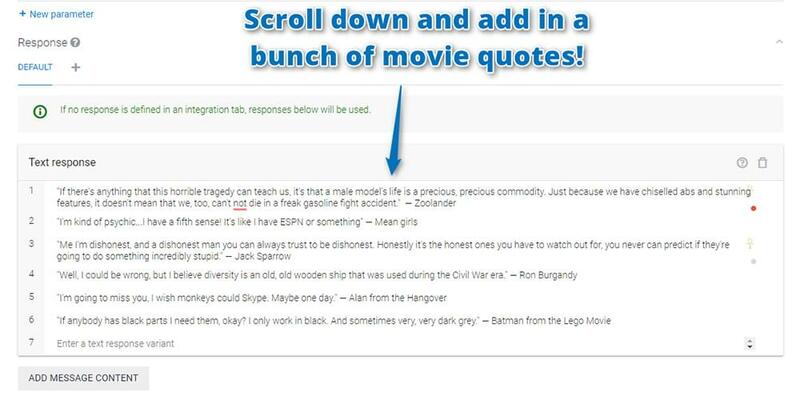 Click “Save” next to your intent’s name once again to create your movie quote intent. 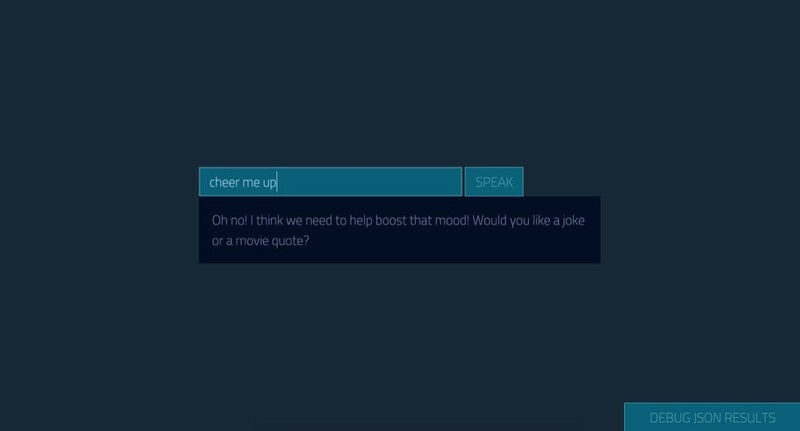 Then in the test console beside it, try entering “Cheer me up” and follow it with “Movie quote”. 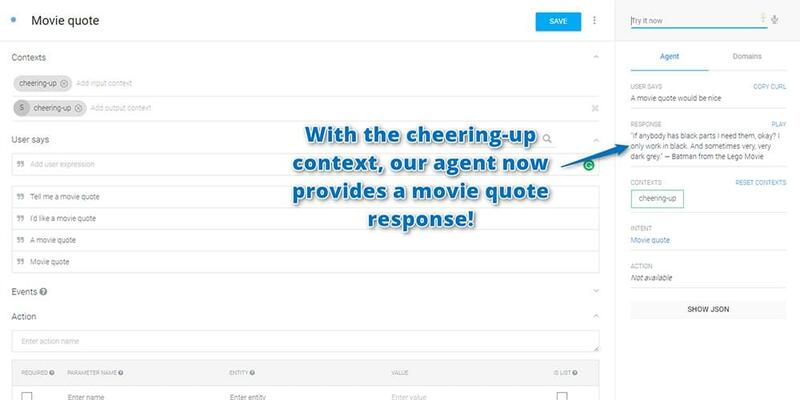 The agent should now tell you a movie quote! You could then follow the same process to add a response for an “A joke” intent too. You also don’t necessarily need to be limited to providing your agent with a list of hard coded responses. 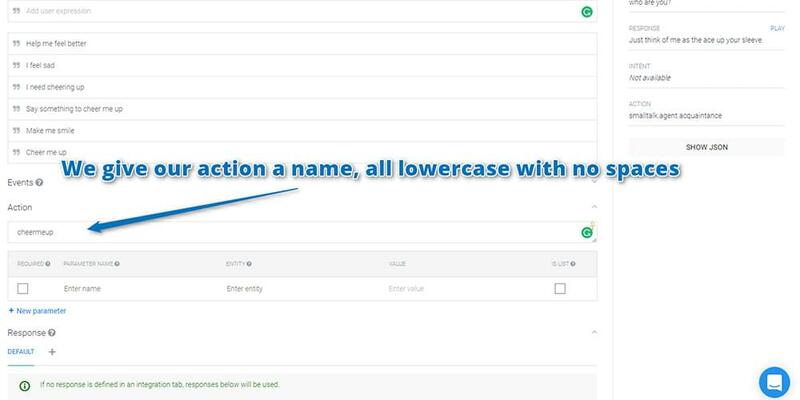 You could instead set an action name for each intent and respond to that action within your web app. This is another concept I’ll be covering in a future article! 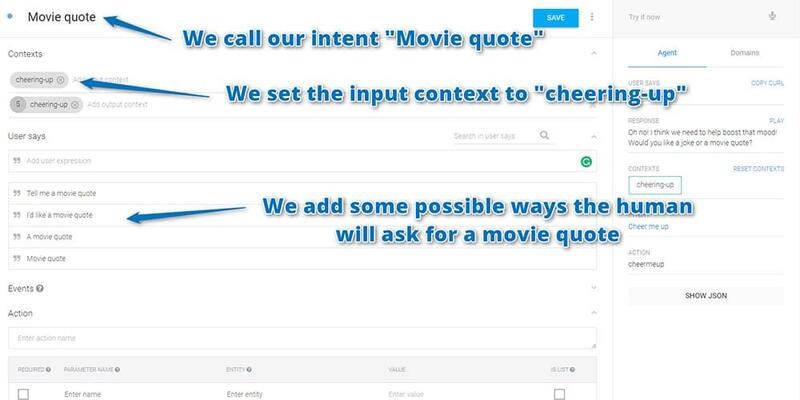 You can be prepared for future additions by giving your “Movie quote” intent an action called “cheermeup.moviequote” (the dot helps you ensure the action doesn’t get mixed up with any future generic “moviequote” action you add in). There are plenty of ways to use the concepts of intents and contexts to personalize your assistant. Chances are you already have a few ideas in mind! 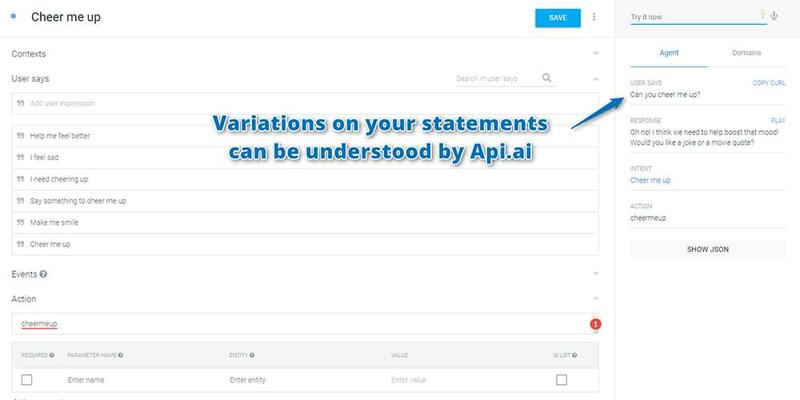 There’s still more we can do to train up our Api.ai assistant by teaching it to recognize concepts (known as entities) within your custom intents, which we cover in the next article in this series! If you’re following along and building your own personal assistant using Api.ai, I’d love to hear about it! What custom intents have you come up with? Let me know in the comments below, or get in touch with me on Twitter at @thatpatrickguy. 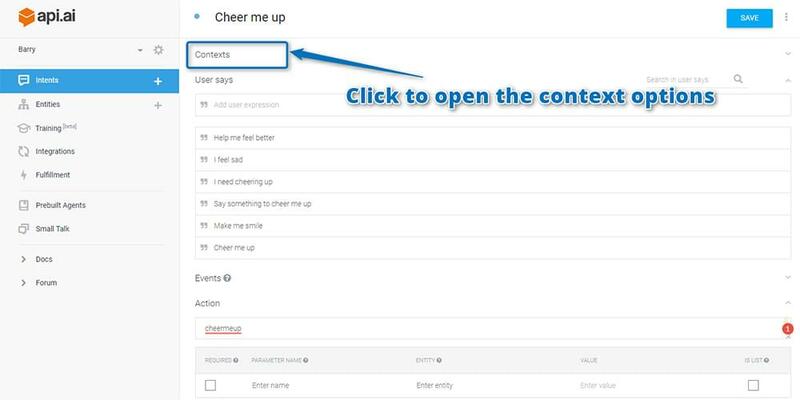 Give your AI the human touch with a sentiment tool. 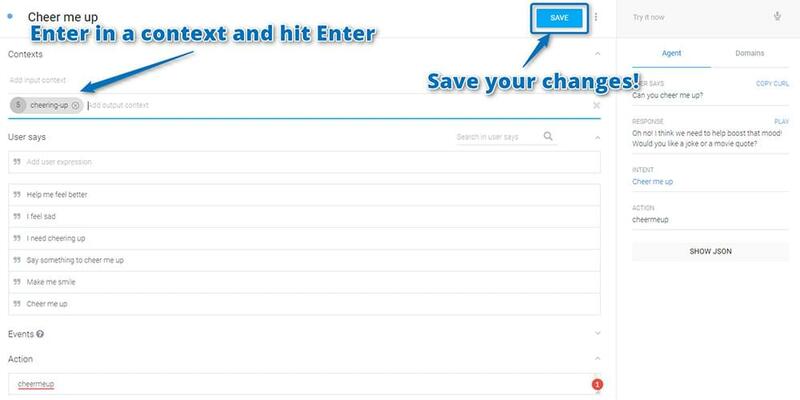 Check out our screencasts on the Microsoft Cognitive Services and the Text Analytics API.